miSecureMessages is a powerful Smartphone paging and messaging application built for Android, Apple© (iPad©, iPhone©, iPod touch©), and BlackBerry© devices. miSecureMessages replaces or supplements paging technology and enables two-way instant communications using the power of your miSecureMessages App (no text or SMS package needed) to easily reply and organize your communications. Already an Answering Cleveland client? miSecureMessages is a secure, cloud-based messaging and notification application that sends encrypted messages to Android, Apple© (iPad©, iPhone©, iPod touch©), and BlackBerry© devices. With the continually increasing number of mobile devices, miSecureMessages uses the convenience of mobile technology, eliminates pager expense, and adds security to keep your information safe. 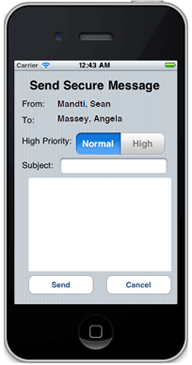 Simply log into the secure miSecureMessages site, select the desired recipient, type your message, and send! The recipient receives an alert that a new message has been received, and can then click to instantly view it using the miSecureMessages App on their mobile device. Since miSecureMessages uses its own App on the mobile device, the messages are kept separate from the recipient's other text and e-mail messages. By encrypting your information, miSecureMessages helps ensure that your data remains confidential. Maintaining the security of Protected health information (PHI) is an important part of the Health Insurance Portability and Accountability Act (HIPAA) which was passed in 1996. A key aspect of the legislation is the "Security Rule", which defines administrative, technical and physical security procedures for hospitals to use to assure the confidentiality of electronic protected health information. miSecureMessages uses encryption technology when sending pages and alerts that may include PHI to Android, Apple© (iPad©, Iphone©, iPod touch©), and BlackBerry© devices, guaranteeing security of any PHI data. The Health Information Technology for Economic Clinical Health (HITECH) Act passed in 2009 was passed to enforce many aspects of HIPAA and helps impose penalties and criminal charges on organizations that violate HIPAA rules. The miSecureMessages app makes it easy for you to communicate securely and immediately by sending a message directly to another user's device. Using the Contacts tab of your miSecureMessages app, you see other miSecureMessages users within your personal group. Simply select the user in the contact list, type the subject and message, and click "Send." The miSecureMessages recipient will instantly receive the secure message. Your secure conversations are kept organized in message threads, allowing you to easily view them at any time. 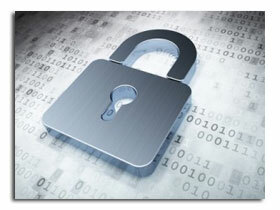 miSecureMessages is a secure solution for sending immediate and reliable messages. miSecureMessages utilizes end-to-end message encryption, ensuring that messages in-transit are secure and protected. miSecureMessages quickly retrieves message information each time the app is accessed, but no information is stored on your mobile device. At any time, you can remotely disable a device's miSecureMessages licensing, so that a person's app cannot log in or access the miSecureMessages database any longer. Trusted Real-Time Reporting of All Message Traffic! 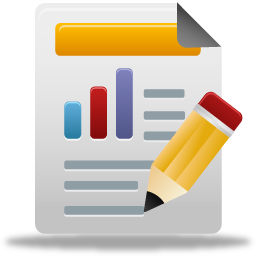 The reports can be exported to Excel or PDF, imported into billing software, and sent to clients or staff. shows complete message histories, with filters including: a date range, by individuals, groups or everyone. The Message Log includes the message Subject, Content, the contact that message was sent from and to, the message sent, delivered and read timestamps, and replies with timestamps within the message thread. lists the numbers of messages sent and received by contacts or groups, and to or from which type of device, as well as total number of messages sent and received for any given individual and group. miSecureMessages Integrates with our On Call Scheduling Solution: making miSecureMessages an even more powerful communications tool within your organization. 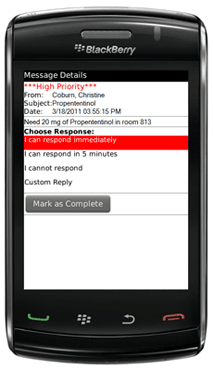 Contact your On-call staff immediately and securely from within your On-call schedule. miSecureMessages is a great way to contact your on-call staff with urgent and important messages, securely. Ensure that your staff received their messages immediately, and view their replies in real-time: saving your organization valuable time and labor. miSecureMessages can be utilized as a contact method for your staff to dispatch messages right from your on-call roster, schedules, and directory. 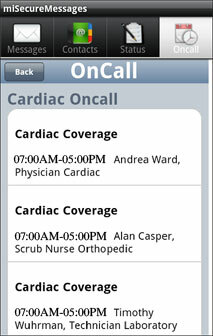 Check Your On-call Schedule On the Go! 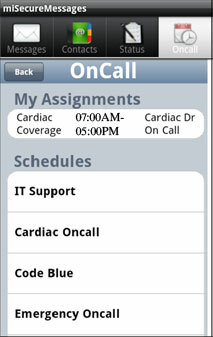 The miSecureMessages app has an on-call tab, which enables users to view their on-call schedule from within app. On-call users can also sync their schedules with Outlook, their smartphone calendar app, and all major electronic calendars. Your business communication needs focus. The miSecureMessages Application on your smartphone lets you focus on your work flow as all of your secure communications are kept separate from the clutter of e-mail and text messages! miSecureMessages two-way messages are organized into message threads, organizing communications with your business peers. And you know it's a business communication by the sound of the persistent alert. 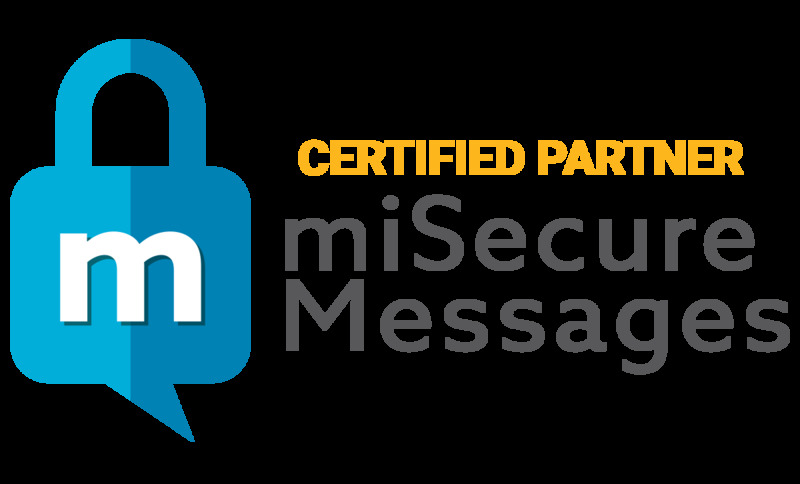 When you need to receive and send immediate and protected messages, you need miSecureMessages! Network connections include 3G and 4G available from service providers and/or internal networks, as well as Wi-Fi in the facility which eliminates mobile deadspots. 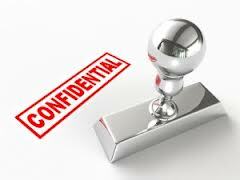 Your business may require that some or all communications be kept secure. miSecureMessages uses end-to-end encryption with all of its messages. Our cloud-based and on-site solutions where messages are also sent from are completely secure and confidential as well. miSecureMessages provides both encrypted delivery and read receipts in its real-time tracking and reporting, documenting when medical staff have received and read their secure messages, as well as their replies. The reporting is available to administrators with the cloud-based or on-site miSecureMessages solution. 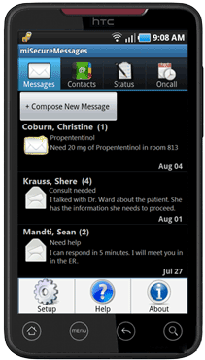 The miSecureMessages app provides a dedicated inbox on medical staff's devices, where miSecureMessages are delivered to. A contact list within the app makes it easy to send device-to-device messages to others within their group. And administrators will be amazed at how easy it is to dispatch messages, look at their reports, and get accurate responses both immediately and securely. When a message is received, miSecureMessages will persistently alert the user with an audio and visual alert until the message is acknowledged. Your organization can eliminate pagers and communicate securely with smartphones and tablet devices using the miSecureMessages app, saving you time and money.